Training for Excel 2013 provides a wide range of interactive video tutorials to utilize the powerful features of Excel 2013. Topics are organized to address specific issues and business needs with interactive tutorials displaying detailed instructions and explanations on mouse over areas of screen. Training includes both instructional content as well as subsequent exercises for applying techniques and performing actions in appropriate order. Tutorials cover many topics from beginner to advanced and are self-paced totaling between 4 and 8 hours of time to complete. Realistic and interactive training simplifies and speeds up learning curve. High quality video and professional voice narration. Find relevant topics quickly through index, glossary and search capabilities. Tutorial and exercise progress is saved within the system. 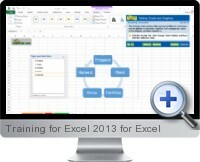 Significantly increases knowledge of Excel 2013 features to improve productivity. Learn and preferred pace and by selective topic depending on requirements.